Articles from the April 2009 issue of the Industrial Worker, the newspaper of the revolutionary union, the Industrial Workers of the World (IWW). Student occupations of university buildings and student participation in campaigns and demonstrations happen more and more these days. More importantly, they have begun to happen in previously unlikely places, community colleges, religious schools, high schools and so on. Students for a Democratic Society (SDS), reborn on Martin Luther King, Jr., Day in 2006, has often been in the lead because the name and the history give today’s students something to identify. Wherever SDS exists, “student syndicalism” also exists in a germ of collective memory about the earlier SDS, or in the basic ideas that campus activists are bound to develop themselves. It’s a simple as the transition from the sit-down strike (IWW) to the civil rights movement sit-in to the antiwar teach-in. The logic of the movement contains a purpose beyond voting or waiting for leaders to make decisions. Recently, former SDS National Secretary Carl Davidson (who coined the term “Student Syndicalism”) spoke on the Brown University campus, where I teach, on a range of issues, mostly practical experiences rather than theories and how students can learn for themselves what to do in today’s multiple social crises. One of Davidson’s vivid 1960s memories and one of my old favorites involves the SDS national office members of 1965-66 realizing that their Chicago headquarters was nearby the IWW office. They had stumbled across an inter-generational counterpart and shortly, regional travelers wore Wobbly buttons. It was hardly the first SDS/IWW encounter. A lot of us had discovered little things along the way, often inadvertently, such as learning Marxism through Socialist Labor Party (“DeLeonite”) study classes, where IWW history was both applauded and hissed (that is after the 1908 Wob convention). What we gleaned sooner or later could be boiled down to the conclusion that the Wobblies were a totally unique radical outfit, and probably generations ahead of their time. History had to move to catch up with them. The Rebel Worker, published by the Chicago surrealist group in the middle 1960s, is the best single case of IWW/SDS interaction. A splendid little mimeographed magazine, in the humble technology of the political age, it marked young Wobblies’ efforts to revive radical principles, reached a wide circle of young radicals (myself included) and foreshadowed much to come. The group also had a local bookstore, a share in the Wob effort to organize blueberry workers in Michigan and a presence in Chicago’s Roosevelt University, where a free speech fight preceded and perhaps inspired the famed Free Speech Movement in Berkeley. A few years later, Rebel Worker activist Penelope Rosemont was a printer in the SDS national office (in a couple decades, she and Franklin Rosemont would operate the Kerr Company, the IWW’s old friends of pre-1920 days). Hundreds of 1960s SDSers in various locations had soon become members or sympathizers with the IWW, and more would after the implosion and collapse of SDS in 1969. 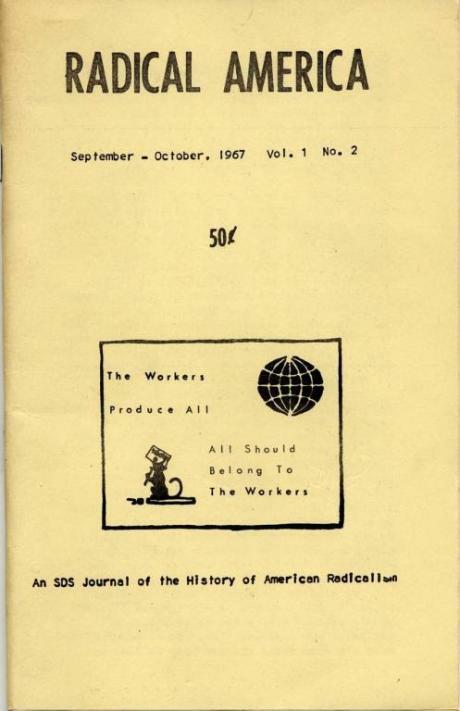 For that matter, the SDS journal Radical America was printed in Madison, WI, on a Wobbly press, emblazoned an early cover with Wobbly graphics, and carried many articles in sympathy with Wobbly traditions. What happened from 1965 to 1969, embodying “Student Power” but also precipitating a crash and a catastrophic turn of the SDS leadership toward Maoism, may best be understood as a brilliant grappling with Wobbly traditions, a reinterpretation of syndicalism, and a failure to deal with the political crises on all sides. The Port Huron Statement, drafted collectively by conference attendees in the Michigan town in 1962 and reshaped by SDS leader Tom Hayden, was the most important political manifesto of American radicals in 30 years, and the most important generational statement that young American radicals had made since perhaps the 1830s of New England Transcendentalists. Unlike earlier platforms of socialists and communists, with the distinct exception of the IWW convention documents of 1905, it was not shaped by European experiences. It was not about “socialism,” at least not in anything like classical terms. It was, or is (in-as-much as the new generation of SDSers holds to its central points) about values, along with generations. That conference had only 59 attendees. Just enough, one might suggest, to work together on a complex document, and not too many to make such work phrase by phrase, formulation by formulation, all but impossible. In the next four years, SDS had become an organization of thousands on many campuses, and cut its ties with the social-democratic Old Left that had paid for its predecessor, the Student League for Industrial Democracy. The spirit of Port Huron had gone beyond the bounds of liberalism, not so much programmatically as philosophically. To these youngsters, the liberal ideology and the reform successes of the New Deal (and additions afterward) did not stand up against the threat of nuclear war and the American government’s own role in the proliferation of weapons. Nor did they explain away the persistence of US intervention, by hook and crook, against movements from Latin America and the Caribbean to Africa, Middle East, Asia and the Pacific that threatened American corporation holdings. Nor could they explain the fate of mainstream labor. Embodied in the thuggish George Meany, president of the AFL-CIO, organized labor’s leadership had become its ugliest in all American labor history. How was a group of powerless young people to cope with the vastness of institutional authority? Students for a Democratic Society, an organization or movement so amorphous that a majority of its “members” never actually bothered to officially join, remains at the heart of the mystique and mystery of the 1960s. Naturally, along with the civil rights and Black Power movement, the Women’s Movement, marijuana and LSD, Bob Dylan and so much more. But within this mélange, SDS is unique, for better and for worse. It was the organization of student power on the campus, pinpointed by the FBI as the epicenter of trouble among the children of the white middle class. It skyrocketed to a following of perhaps 200,000 supporters. And what went up came suddenly down, very much like the ‘60s themselves. Almost as suddenly, the memory of SDS and of the antiwar protest of the 1960s in general, has returned to fashion or at least public interest. What the Vietnam War and the public knowledge of FBI misdeeds did to the trust in the U.S. government during the 1960s, including its agencies and elected officials, the Iraq War and the Patriot Act’s varied manifestations have done again. And there is an element, a stronger reminder perhaps than any other of the lasting impress of SDS, in the circumstances of generational unrest. The generation of 9/11, come of age in the wake of the World Trade Center attack, the Afghanistan attack and occupation, the mass detentions without charges and so on, is also the generation facing the literal, undeniable effects of global warming in daily life. The world of secure consumers, circa 2000, is gone, and in its place is a world of politicians who barely manage to keep a straight face while issuing frequent denials of the obvious. All this is still more true of the global working class now located, thanks to post-1965 immigration, within the United States. Never has the world of the original Wobblies become so nearly the world of today, with masses of foreign born, a terribly weakened official labor movement, and an urgent need for solidarity. Speaking as a U.S. history teacher, I can say that the college courses on the 1960s, going back to the later 1970s or 1980s, never lacked for a certain appeal. Free love, communes, LSD and other reputed mass phenomena of the young naturally appealed to another generation of the young, especially with higher rents and rampant venereal diseases closing off the carefree low-income bohemia of earlier days. The boom in those courses has increased immeasurably since 2001 or so, for every good reason, but for many students seeking a “how to” rather than vicarious thrills or the chance to listen to music rather than reading textbooks. Meanwhile, as if by remarkable coincidence, a generation of young scholars just ten or twenty years behind the radicals of the 1960s came to press with their scholarly studies going back a decade in graduate school. Only in the last decade, as the former members of SDS entered middle age, has the understanding of the movement seriously thus begun to probe and poke the aura and the memoirs of prominent minority. Hostile critics have pointed to the number of young intellectuals involved and the few essayists produced, as if this were a key test of virility or fecundity. It would be better to meditate the paucity of local historical studies, because SDS was above all a local movement, arguably the most decentralized and localistic movement since the Wobblies in the whole history of American radicalism. But perhaps one problem has also been overlooked: that a phenomenon so deeply set within popular culture would need an approach shaped by the techniques of cultural production. A song might be grand, but could not be expected to go far lyrically. The graphic history of SDS that I produced with an array of artists in 2008, following the 2005 graphic history of the IWW by some of the same artists (and me as editor or coeditor), on the other hand, offers a crime (in the view of respectable society) to fit the punishment (forty years of liberal and conservative denigration). These books also could not have come, I believe, at a better time. Because these movements face the prospect of a great revival, young people in particular can learn visually, and also come to appreciate radical artists, like the half-dozen IWW members who drew or wrote stories for “Wobblies!,” striving to make the old story newly meaningful. Paul Buhle is the founding editor of Radical America (1967-1992).